•Germany Black Crystal Beer Stein •Features pewter raised relief of Germany crest •500 piece limited edition •Includes metal seal attached to the handle with number of limited edition on back •Handcrafted in Germany by Zoeller and Born •Made of crystal with pewter lid •.5 Liter •Approximately 11 inch tall (28cm) •This part number consists on ONE stein. •The glass is crafted by skilled German artisans and is hand cut in painstakingly precise detail. The fine pewter raised relief was created by expert sculptors from the house of Zoeller and Born and hand forged of 95% pure pewter. 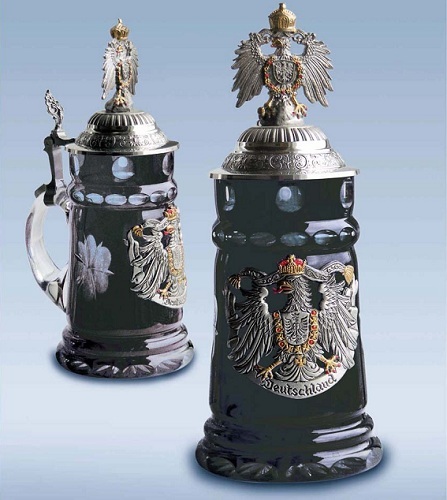 The metal seal attached to the handle is Zoeller and Born's guarantee of an extremely limited production of this stein of only 500 pieces world wide. •Zoeller and Born is a family owned operation that has been producing high quality beer steins since 1956. They specialize in steins with stunning hand painted relief. Zoeller and Born is one of only a few remaining German stein companies that still produce their steins in Germany with 100% German materials and German labor.